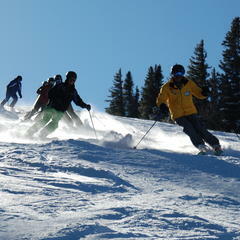 Skiers tackle moguls in one of Taos Ski Valley's camps. Lack of deep powder got you bored? Might be time to focus on technique without powder distractions. You can sign up for a one-shot lesson in hopes that your instructor nails the perfect tips. But you may see more overall improvement by immersing in a multi-day camp. So what kind of multi-day programs are still out there in 2015? 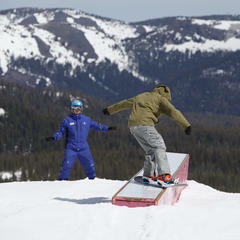 An instructor coaches a snowboarder learning terrain park features at Mammoth Mountain. 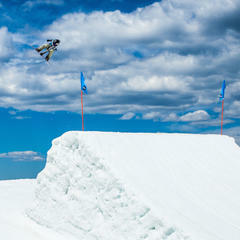 Mammoth Mountain can get skiers and riders airborne in two-day Unbound Terrain Park Camps, Feb. 21-22 or April 11-12. You’ll start with learning tricks on easy features and then progressively step up bigger. 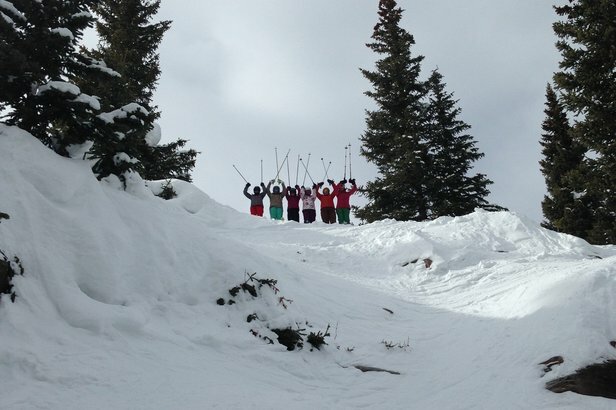 Advanced skier camps take skills a turn further with the same progression techniques. All Mountain Ski Camps, Feb. 23-25 and March 20-22, refine techniques in whatever the mountain throws at you, steeps to powder. For flying through mogul fields, join a two-day camp March 7-8 or April 11-12. To make reservations, call 800-MAMMOTH or 800-626-6684. 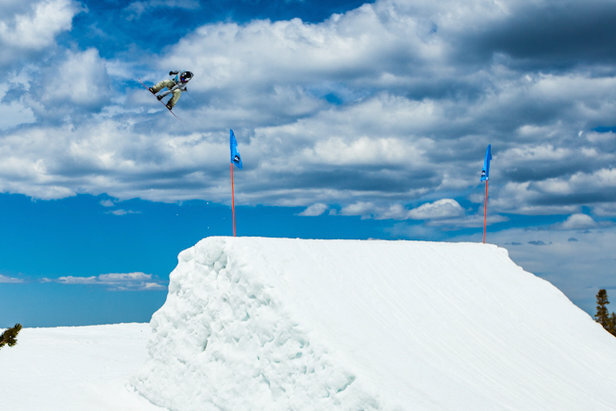 Eric Willet catches air at Mammoth Mountain. Building in practice time for experiential approaches to learning, Taos Ski Valley runs Snowsports Weeks all season long. Camps start every Sunday with two hours of instruction each morning through Friday. You have the afternoon to practice what you’ve learned. Each week includes an interactive Tech Talk to get your head in the game with biomechanics, psychology and body awareness. Teen and college versions of the program coincide with vacations, and one Super Ski Week, Feb. 22-27, ups the instruction to full day for those who want to immerse themselves more. Shorter two-day camps pack concentrated full days of instruction into weekends. To notch up the fun factor, advanced skiers and riders can get a two-day dose of instruction in steep chutes and moguls Feb. 14-15 or March 14-15. For more information, call 866-968-7386 EXT. 2355. 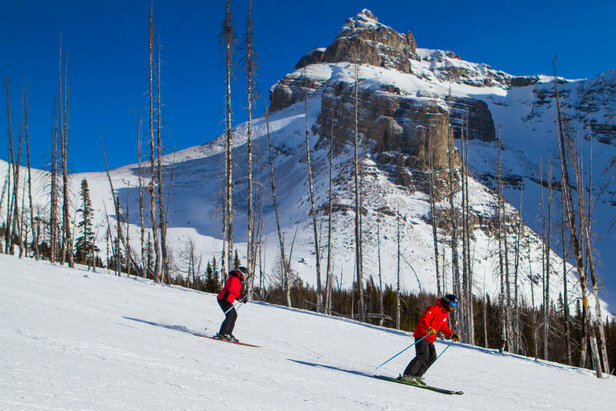 Ski Big 3 programs for Club Ski run three-day lessons with the same instructor at Sunshine Village, Lake Louise, and Mt. Norquay. In Banff, Ski Big 3 combines three days of intensive instruction with skiing three different resorts: Sunshine Village, Lake Louise and Mt. Norquay. Open to all levels of skiers, Club Ski introduces each mountain with a guided tour and focuses on skill development for the conditions of the day. Despite the different resort each day, the same instructor stays with you for all three days. Club Ski programs run April 2, starting each Sunday and Thursday. A Junior Club Ski program for kids ages 6-12 runs concurrently with the adult program, making the two programs jive for families. Ski Big 3’s tri-area lift ticket and transportation from Banff take the hassle out of going to three different resorts for the lessons. For more information, call the Banff Ski Hub at 866-760-7731. 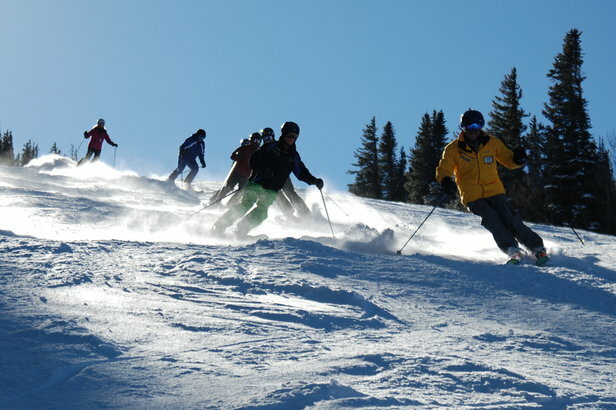 Skiers can learn backcountry skills in the Teton Mountains at Jackson Hole Mountain Resort. If Teton Mountain backcountry is on your bucket list, you don’t have to wait to be an expert. Jackson Hole Mountain Resort’s four-day backcountry camp launches you into necessary skills with avalanche awareness, terrain selection and touring techniques. The March 11-14 program mixes mornings on snow with afternoons in a classroom. Building on backcountry ski and snowboard skills, the three-day Stephen Koch Ski and Snowboard Mountaineering Camp on March 7-9 expands your repertoire with snow climbing, crampon and ice axe use, navigation and rope work. For reservations or more information, call 800-450-0477 or 307-739-2686. Master moguls or any terrain in front of you at Her Turn, a three-day women's clinic in Vail.